CVC Night: Games and Pizza Night! Come on down to the common room for a fun and frivolous night of challenging and stimulating board games to test your mental prowess…or just come and lounge around and eat pizza. The choice is yours! See you there! Join us in repurposing second-hand materials to create and decorate various cool things such as birdhouses, reusable bags, kites and more! Join us for our Zero Waste Shop Tour to explore together some great nearby sustainability-conscious shops. Spend some fun time with fellow IH residents and find out new ways how we can all shop more sustainably and sometimes for less! Watch the brave and the brawn clash for the championship title. We are screening all three matches on Saturday, 16 March in the Common Room. Relax and unwind with some crayons and cupcakes. Indulge in a sweet treat and decorate cupcakes with tasty toppings while you colour the afternoon away! All attendees will get a plant to take home. Come join us on March 3rd at 3PM in the Common Room! Every Wednesday in the Squash Court. Join us for this introduction session to learn some basic self-defence techniques. Please make sure you wear socks or non-marking shoes. This event is part of Stay Safe week at IH. Click here to find out more details about events and resources available. Brook has been at the forefront of providing wellbeing and sexual health support for young people for over 50 years equipping young people to make positive and healthy lifestyle choices. Ask Brook is here to help you with whatever question you might have about your sexual health or relationships. The service is located at Euston within easy reach of IH. Brook can sign you up for a C-card - the free NHS condom distribution service for under 25s - no names, no judgement. Ask Brook at the stall. If you prefer to speak to the advisor in private please let them or an RA know. What should I do if I think someone is following me home? How do I protect my phone form being stolen? How can I call the police if I am in a dangerous situation but speaking aloud will make it worse? A Metropolitan Police Officer comes on site to advise on any questions you may have related to staying safe in London. 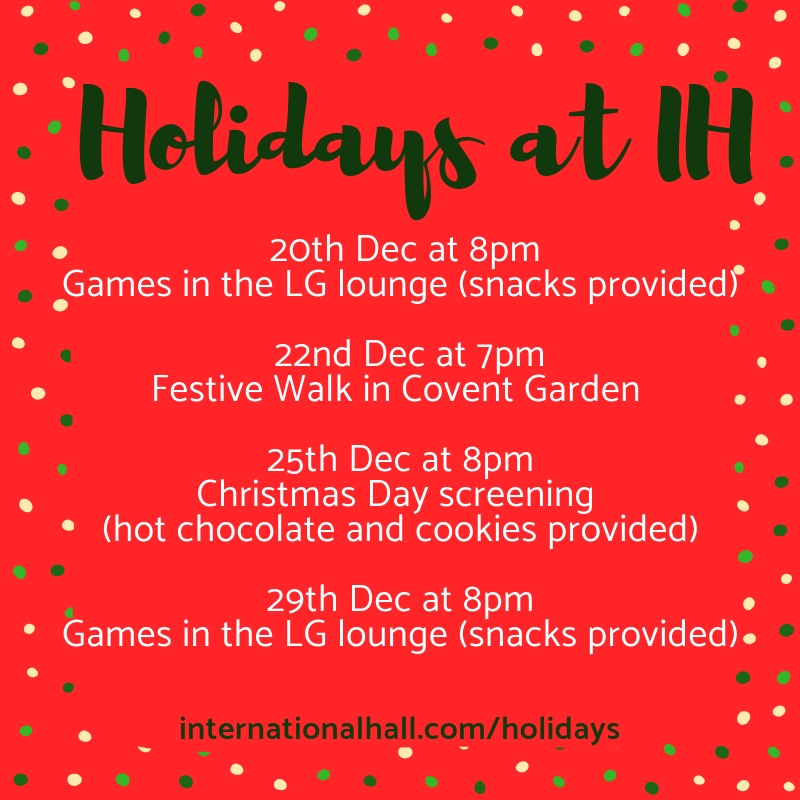 Join us for a walk around Covent Garden and Leicester Square! We will enjoy the Christmas lights and the festive mood. There will be an opportunity to stop by the LEGO and M&M's World stores, as well as the Christmas market at Leicester Square. No prior experience is needed and all levels are welcome. Join us for the International Hall’s annual ‘Murder Mystery Evening’! The murder mystery evening is an interactive theatre event, where professional actors will present to you a story of a fictitious murder. You would not know the full story and you will be given clues as the evening progresses. You will work in teams to solve the mystery. At just £5 including refreshments, this professionally-led interactive drama is not to be missed! Cash to Reception: Please bring £5 cash and a slip of paper with your name, room number, and email in some sort of envelope to reception at any time. The reception staff will be informed about the process, but if they don’t understand ask them to put it in Matthew’s pigeon hole. I will then send you a confirmation email. Bank Transfer: Please transfer £5 to the account below, AND send an email to matthew@internationalhall.com to inform me that you have done so. I will then reply with confirmation of your purchase. 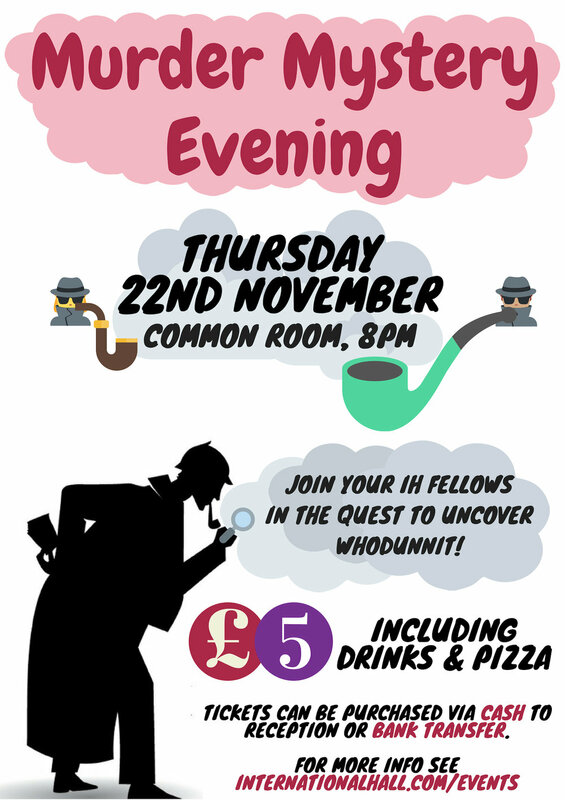 Join us for the IH Quiz Night on Tuesday 6th Nov at 8:30 pm in the Common Room! We will aim for teams of max 8 and min 4 people and will make sure that everyone who comes will be able to join one. The quiz is free and there will be refreshments provided and attractive prizes for the winners! Come and join the Halloween Party for families at IH! We promise to create the right atmosphere so that Halloween is a little bit spooky but not at all scary. Look forward to the most dubious of snacks and entertainment, prepare a monstrous costume and let us help with the face painting. Happy Halloween!